I have a sweet tooth. Not just one actually, a whole mouthful. Hawaiian malasadas have a well-deserved reputation for being, well, addictive. If you’ve ever had a beignet in New Orleans, it’s like that, but possibly better because malasadas can be customized. 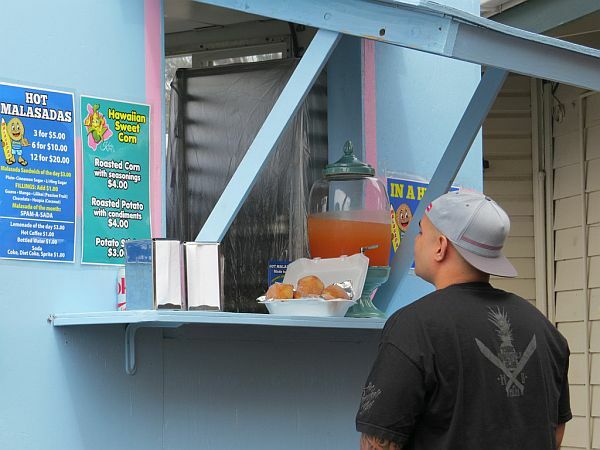 A malasada is a ball of dough, deep-fried and coated with sugar. 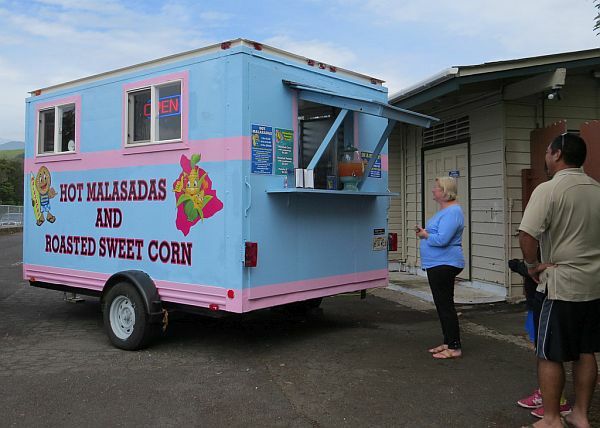 Reportedly brought to the islands by Portuguese immigrants, my husband and I stumbled upon Manuela Malasada Company after wandering through the Waimea Homestead Farmers Market. There was a short line in front of the colorful blue food cart and the malasadas are cooked to order, so we had to wait about ten minutes for our warm sugar rush. No one was eating when we arrived, so we couldn’t cheat by checking out what others ordered. Winging it was the only way to go, but there really wasn’t much for us to get wrong. 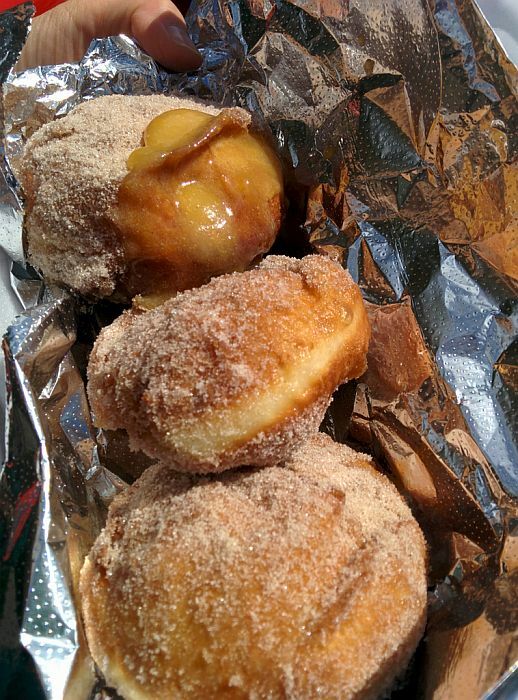 Three malasadas for $5, and an extra dollar for any fillings. 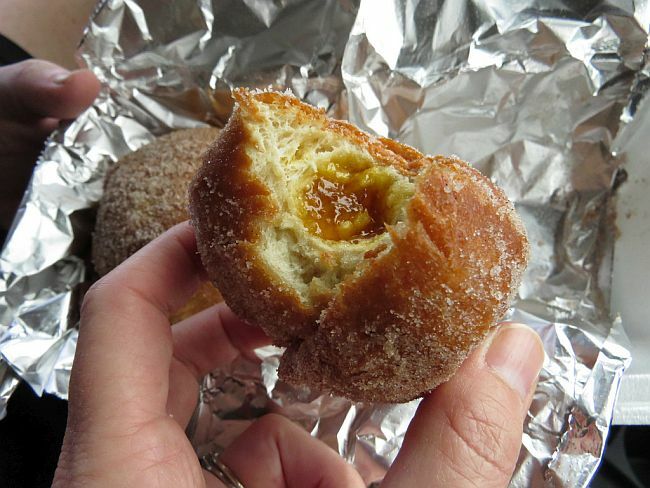 The fist-sized malasadas can be filled with guava, mango, lilikoi (passion fruit), chocolate or haupia (coconut). They can be plain on the outside or coated with cinnamon sugar or tart Li Hing sugar. We opted for cinnamon sugar on the outside and inside we went with one filled with chocolate and one filled with lilikoi. We left the third plain. They were all amazing. There aren’t any tables, so odds are you’ll be eating in your car. We were covered in cinnamon sugar and it’s a good thing we grabbed extra napkins because we needed every last one. Three malasadas is more than enough for two!